A good small functional axe is always a must have in any outdoorsman’s backpack. I recently got a chance to review the Off Grid Tools Survival Axe and was not disappointed. This axe is small enough to fit in a backpack and just the right amount of weight to chop wood for a fire or hammer in some tent stakes. The Off Grid Tools Survival Axe has 31 built-in features for just about any survival condition. It is also a great option to keep in your car for an emergency situation. It is a well-designed axe. The Off Grid Tools Survival Axe comes equipped with 31 different functions. This is the most fully equipped axe I have seen. Let’s look at some of its features. I was able to test this axe, including several of its features. The first thing a noticed was how well it feels in your hands. It has a nice grip and weight. It is easy to carry around. The blade of this axe is sharp, right out of its sheath. The Off Grid Tools Survival Axe easily chopped the wood I had on hand, so you could build a fire. With any axe, it’s size will limit how long it can take to chop a pile of wood. This axe gave me even and effective strikes. The 6-inch saw did a decent job sawing through a piece of wood. It did take a bit of effort to get a rhythm going. It is a nice feature to have in an axe. Many times a saw can be helpful when building a structure because it allows for smooth cuts when compared to an axe. The saw blade locked firmly into place during sawing and folded up into the handle nicely after I was done. The hammer is well sized and shaped. It easily drove in loose nails. It also comes with an effective hammer claw and pry bar. I was really impressed with these features. It truly makes this axe a survival axe. The protective sheath is made of nylon and covers the axe well. It has a Velcro strap the holds it firmly in place. It also has a convenient loop to attach it to a carabiner or tie down. The Off Grid Tools Survival Axe is small enough to fit snugly into my backpack. I was easily able to place it in my pack and zip it up. You could also attach it to the outside of your pack to save room. The Off Grid Tools Survival Axe is available at these retailers. 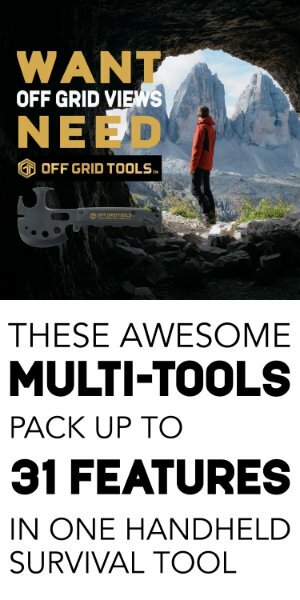 Get a 10% discount at Off Grid Tools using the Bushcraft10 code at checkout. The Off Grid Tools Survival Axe is a great option to have in your backpack. It elevates the need to carry a separate axe and saw. This can help save room and weight in your pack. Overall I would recommend this axe to anyone who wants a small functional axe to bring on a hike, out in the bush or on a camping trip. This axe will have a permanent home in my pack. Disclaimer: I was provided this product for an honest review. Out in the bush, it is practical to bring an average size hatchet axe for clearing and better visibility. Great for improving your shelter and chopping some wood to start a fire. The S.A. Wetterling Hunter’s Axe is delivered with a hickory handle and a leather sheath. This axe feels right in the hand, looks just like an axe should and works perfectly. The balance is just right. The head is just the right weight to split up to 8inch logs and if you split from the side as opposed to the top, you can get such great control of the cut. The handle is not as polished, but with a little linseed oil, it is good to go. The forging of the head is a classic with great steel and very sharp out of the box. The S.A. Wetterling 16H Small Hunters Axe has perfect balance and blade angle. The steel is hard enough to hold a good edge and can be easily sharpened. If you had to pick one tool to take in the back-country this would be it. The S.A. Wetterling 16H Small Hunters Axe is a nice little axe that will fix in just about any pack. It is sharp and functional. Well worth the price. A slightly more powerful axe with a rounded neck, hand-forged and made from Swedish steel using traditional methods in use since 1697. The steel is stuck several times, increasing its density and thereby the durability of the axe. Ideal for hunters who both skin animals and carry out light forest work. Has a clear tempered zone so the axe can be sharpened without detracting from the strength of the edge. A stout axe designed with the huntsman in mind. Great for general field work. Fit and finish are very good, the blade is sharp enough to shave right out of the box. The Hultafors Classic Hunting 850G Axe holds it’s edge very well with minimal maintenance. It’s a good compromise between size and utility, it has enough weight and length to process firewood effectively. This axe is compact and light enough to take backpacking. This axe is a work of art and is a pleasure to use. Still, Have Not Found Your Axe? Check AliExpress for Your Next Outdoor Axe? Search AliExpress Here for Your Next Axe. The Hultafors Classic Hunting 850G Axe is a good quality axe that will last for many years to come. It is small yet versatile and will fit nicely in your pack. The Gransfors Bruks Small Forest Axe has a large head and a long handle, therefore, provides more chopping power. However, it is still small enough to fit into a rucksack. Practical for splitting small sticks or cutting limb wood. Super clean cuts with enough leverage on the length of the handle to take down small rounds (about 6 to 8 inches). Very useful for taking out large chunks of material. The Gransfors Small Forest Axe arrives razor sharp right out of the box and will stay that way even after cutting limbs and chopping trees. Easily splits firewood and is small and light enough to be carried in a small backpack or on your belt. If you want one camping and bushcraft axe to do it all, this is it. The Gransfors Bruks Small Forest Axe is Swedish quality and craftsmanship. This axe is very well made and functional. Great for any job. The Estwing E24A Sportsman’s Axe is a high-quality woodsmen axe. All of the Estwing axes have been made in the USA since 1923. This axe is manufactured from 1055 carbon steel and heat treated to ASME safety requirements. This axe is forged from one piece of steel which offers great balance and strength. You can easily secure the axe to your belt or strap it to your pack. This axe handle is made with quality leather for comfort and great grip. This axe will stay firmly in your hands. The Estwing E24A Sportsman’s Axe is designed to minimize the shock that is transmitted through the handle during chopping, so you will not have any stinging in your hand. You will not have loose hatchet head on this axe because the head and shaft are drop-forged from one piece of fine steel, which means fewer points of failure. It also comes with a sturdy Nylon sheath. The Estwing E24A Sportsman’s Axe is available from these retailers. If you are looking for a well made outdoor axe, look no further. This axe is small enough to fit in just about any backpack. It will get the job done in any bushcraft situation. Estwing makes quality axes that will last a lifetime.